SBOX-2170 is a fan-less Box PC. The hardware platform is designed with Intel® Atom™ Processor D2550 Dual Core 1.86GHz which provides perfect performance and low power consumption. SBOX-2170 is equipted with the Intel® NM10 Express chipset, and DDR3 SO-DIMM up to 4GB. 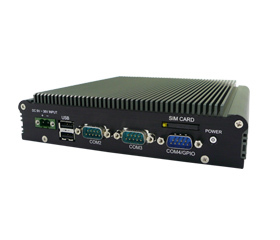 SBOX-2170 provides high reliability rugged mechanical design and the Operating Temperature is -30 to 60°C. The compact chassis dimensions are 182 x 167.6 x 40mm so it could easily be integrated into most critical space applications. The SBOX-2170 offers dual independent display capability through DVI-I, Dual GbE LAN ports, 4x USB2.0, 3x RS-232, 1x 4 In and 4 Out GPIO, and 3x miniPCIe socket for optional wireless module connection, either WiFi or 3G/4G LTE module. SBOX-2170 supports 9-36V DC input, Reverse Polarity protection, OCP (Over current protection) and OVP (Overvoltage Protection). With Dual independent display and good graphic performance, the SBOX-2170 is a nice choice for public information, Kiosk, access control, data acquisition controller, digital signage. …etc.